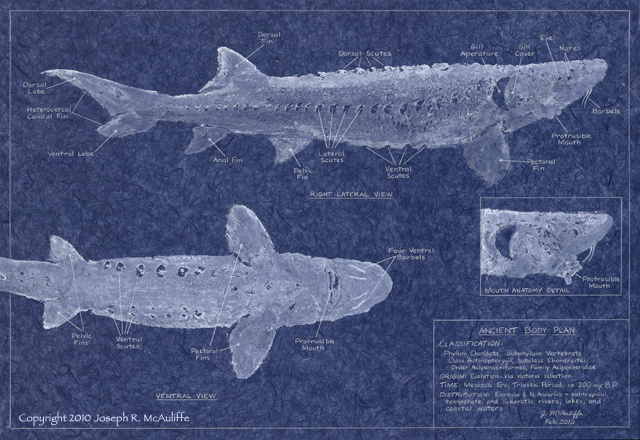 Sturgeons have been around a long, long time; they swam when dinosaurs roamed on land. Modern-day sturgeons are little changed in appearance from fossilized remains 150 million years old, earning them the label “living fossils.” Most modern-day bony fishes have a symmetrical (homocercal) tail, but in sturgeons, the axis of the spine continues into a long, tapered upper lobe (heterocercal tail). The sharks, also ancient in origin, also possess this kind of tail. Although sturgeons are more closely related to bony fishes than they are to sharks, like the sharks, their skeletons are composed primarily of cartilage. 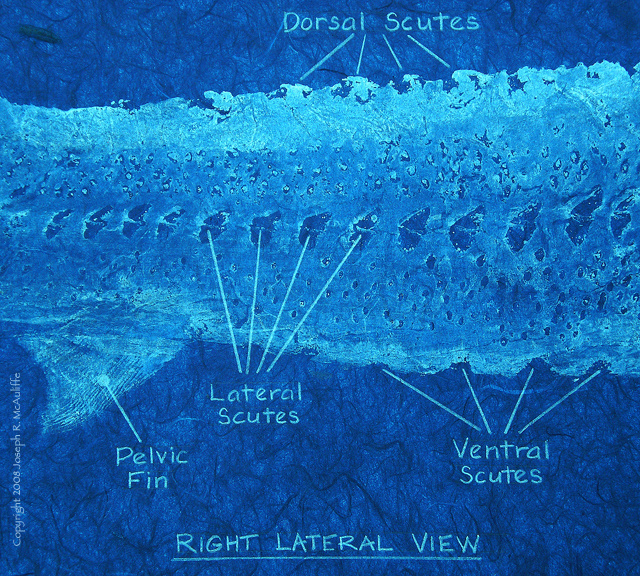 Sturgeons lack scales and are covered by very tough, leathery skin and rows of ridged, bony plates called scutes. Their eyes are small; four sensory barbells in front of the mouth drag over the bottom, enabling them to detect food. Extending its protrusible mouth, a sturgeon feeds by suctioning in its food from the bottom like a living vacuum cleaner. Despite the lengthy time sturgeons have persisted on earth, collectively sturgeons are more threatened than any other group of fish due to the actions of humankind. Overfishing, damming of rivers, and pollution have contributed to the demise of sturgeons in various parts of the globe. The sturgeon family Acipenseridae contains 26 species found only in the northern hemisphere. Some species are among the largest fish found in the planet’s rivers. The largest recorded was a giant European sturgeon or Beluga (Huso huso) caught near the mouth of the Volga River in 1827. That fish measured 24 feet long and weighed 3,250 pounds. In the basins of the Caspian Sea and Black Sea, overharvest of Beluga for the production of caviar from their eggs has left this magnificent species critically endangered and protected internationally. Overharvest for meat has extirpated other sturgeon species from some places in Europe and North America. Sturgeons typically grow very slowly but potentially can live very long and cannot withstand the heavy fishing pressure to which they have often been subjected. Large species of sturgeons typically occupy big rivers and migrate upstream from coastal estuaries and deltas to spawn. The damming of large rivers has obstructed the spawning migrations, threatening the continued survival of some species. The Chinese sturgeon (Acipenser sinensis) of the Yangtze River can attain lengths of up to 13 feet and weights of 1000 pounds. This species once travelled from the river’s lowermost reaches more than 2000 miles upriver to spawn, the longest spawning migration of any sturgeon species in the world. That lengthy migration ended abruptly in the 1980s with the completion of the Gezhouba Dam at Yichang, located 990 miles upstream from the river’s mouth. The more recent completion of the Three Gorges Dam further upriver additionally impedes any movement of remaining populations. Although a program has been in place since the 1980s to maintain Chinese sturgeon populations in the Yangtze with hatchery-propagated stock, populations have nevertheless declined precipitously and the fish is critically endangered. The smaller Yangtze sturgeon (Acipenser dabryanus), which grows to lengths of four to five feet, has met a similar fate due to damming of the river. Like the Chinese sturgeon, the Yangtze sturgeon’s continued existence in the wild probably depends on artificial restocking programs. Not all wild populations of sturgeons are so greatly imperiled. In the lower Columbia River of the United States, a healthy, naturally reproducing population of the white sturgeon exists below Bonneville Dam. A strictly regulated, limited harvest of this population is allowed. Knowledge of the reproductive biology of sturgeons has enabled captive breeding and rearing in fish farming operations. Farm-raised sturgeon are used for production of both caviar and meat and potentially can eliminate fishing pressure on imperiled wild populations. In the United States, most notably in California, several species are currently raised in fish farms. Those species include the native white sturgeon of the Pacific Northwest, as well as several species from the Old World, including the giant beluga. The fish used in this gyotaku was a farm-raised white sturgeon. Click on a thumbnail to see a larger detailed image.